The Decepticons unite with Titan Master partners to power up for battle! Astrotrain uses the cloaking ability of Darkmoon to trave behind enemy lines without being detected. Astrotrain is a character that's very close to my heart. Not because of his appearances in the cartoon, mind you, which don't amount to a hill of beans. And certainly not because of the comics, where I'm not entirely sure he even had a speaking role. And not because of the original toy either, because that was long gone before I was old enough for Transformers. No, the reason I love Astrotrain this much is this very site -- it's RPG section, to be specific. In our original game, Astrotrain quickly became the #2 Decepticon and stayed at that level for nearly a decade's worth of gameplay, becoming one of our most important and most developed characters as well as one of the "constants" of the universe. Astrotrain was always there and you knew he always would be...until Megatron shot his head off in that storyline's grand finale, anyway. 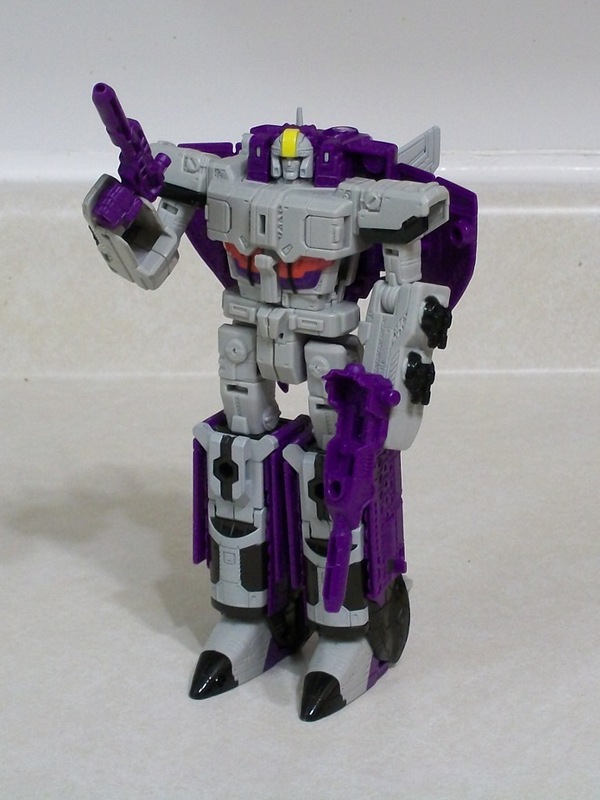 The Titans Return line is, coincidentally, packed full of characters that I only care about because of our various RPG storylines -- Astrotrain, Mindwipe, Weirdwolf, Octane, Sixshot, Black Shadow, Pounce, Quick Switch -- but A-Train here is definitely the head of the class and I was pretty curious to see how he'd turn out. When we eventually saw the stock photos of him, I can't say I was all that impressed. None of the modes were retooled at all from Sentinel Prime, and I was already familiar with his many pretty serious flaws. In fact, I was pretty sure I'd just be sticking with my old Classics Deluxe of the character (a flawed toy in its own right). But then I ran into the TR figure when Toys'R'Us had Voyagers on for 50% off before Christmas, and I figured, why not? 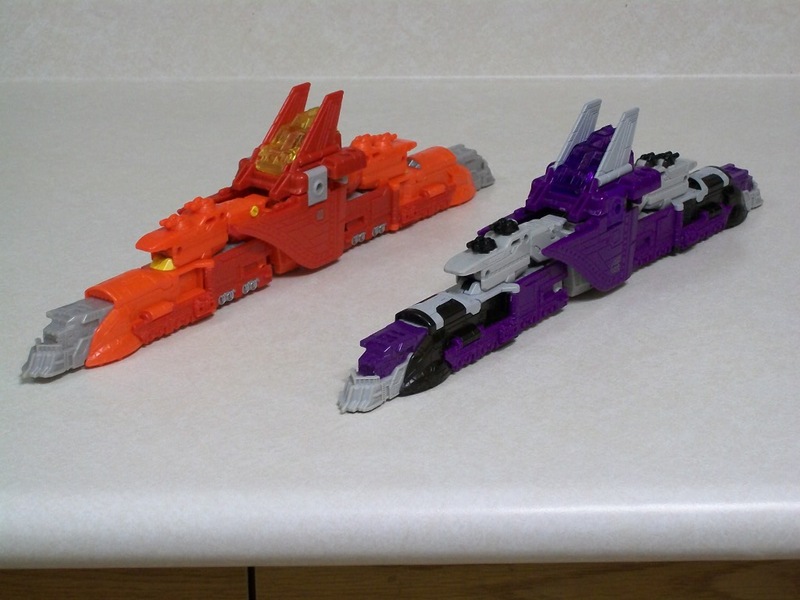 Robot Mode: Well, Astrotrain is definitely an improvement over Sentinel Prime on this front. The Autobot leader's quest to make Cybertron great again is hindered by being a blazing orange eyesore with less paint than a park bench that's been left exposed to the elements for a couple decades. Astrotrain has probably double the amount of paint applications, so instead of being a drab light grey mass he features ample splashes of black as well as some purple, yellow and red highlights. His light plastic colour makes all the molded detail quite visible, and the end result is a figure that looks like...well, a whole lot less like an unpainted prototype that's been stolen from the factory. The colour scheme has raised a few eyebrows because the figure's sculpt is very clearly based on his 80s character model (unlike the Classics figure that homaged the original toy) but the colour scheme is absolutely nothing like what he looked like in the cartoon. The fact that he was a non-entity in the comics means that most people don't realize that these colours -- a very light grey body with solid purple wings and purple on the outside of his legs -- is a nearly spot-on recreation of how he looked in the Marvel books. Why in the world Hasbro would make a choice like that, or whether it was intentional at all, I don't know. But the end result looks pretty good, even though a lot of people are going to understandably prefer the cartoon-accurate dark grey Takara figure instead. 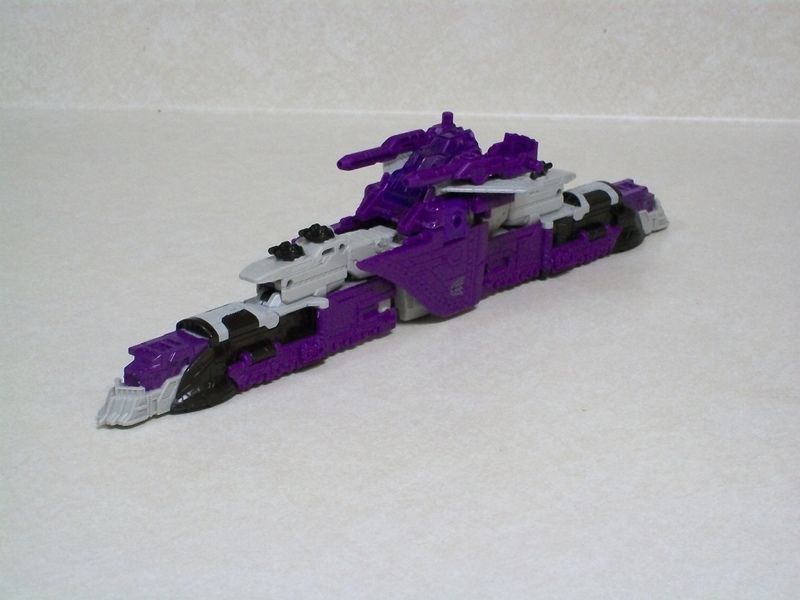 Astrotrain comes with two weapons, one small rifle that has a fairly close resemblance to the original's ionic displacer rifle, and a larger one that serves as a chair for a Titan Master figure. Neither one looks particularly good on their own, because the small gun looks a bit puny in his hands and the larger one is...well, a chair. Fortunately, you can combine both guns into a single weapon that's both larger and less furniture-like. 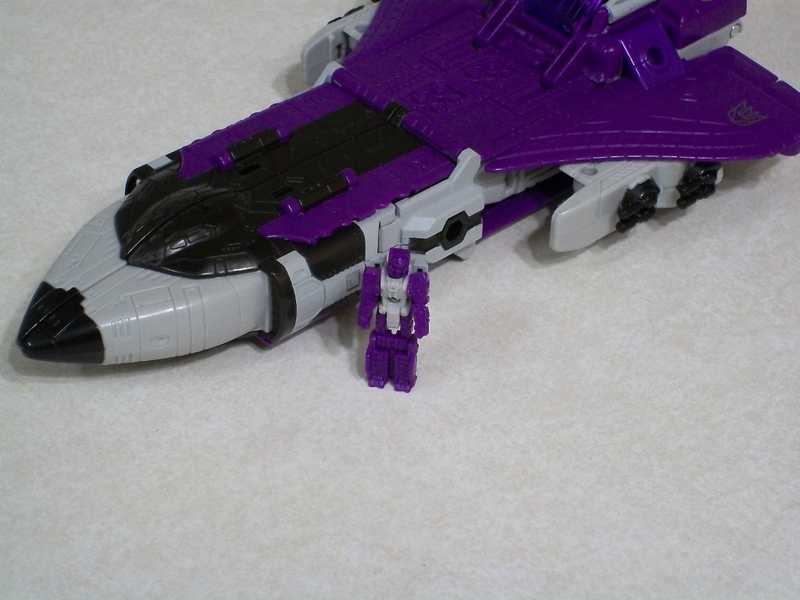 Even then it's not super impressive though, which is probably why my Astrotrain has stolen Thrilling 30 Blitzwing's sword (a near-perfect colour match). Astrotrain has fairly basic articulation for a modern toy: universal-joint shoulders and hips, thigh and bicep swivels, elbow and knee hinges and a ball-jointed neck. He also has some forward and back ankle articulation due to his transformation. Astrotrain is one of the few Voyagers who actually look better with their spring-loaded face-guards popped out, which is unfortunate because that actually restricts the head joint pretty severely. The biggest problem, however, is his legs. The joints are perfectly functional, but their placement leaves lots to be desired. Astrotrain's shins and feet are nearly double the length of his thighs, which means that bending his legs does basically nothing to reduce his height and he's simply not capable of getting into a decent crouching or kneeling pose. In fact, the leg articulation is really kinda useless, and combined with the lack of a waist swivel, leaves Astrotrain feeling just a bit stiff. Overall, I'm a big fan of how Astrotrain looks but when you actually get around to playing with him he's a bit of a disappointment. Shuttle Mode: Certain Transformers have alternate modes that truly deserve to be called "iconic". The original Optimus Prime's flat-nose semi cab. Soundwave's microcassette player. Grimlock's tyrannosaur. Beast Wars Primal and Megatron as King Kong vs. Barney. Movie Bumblebee's Camaro. And many more that I'm not listing, I'm sure. 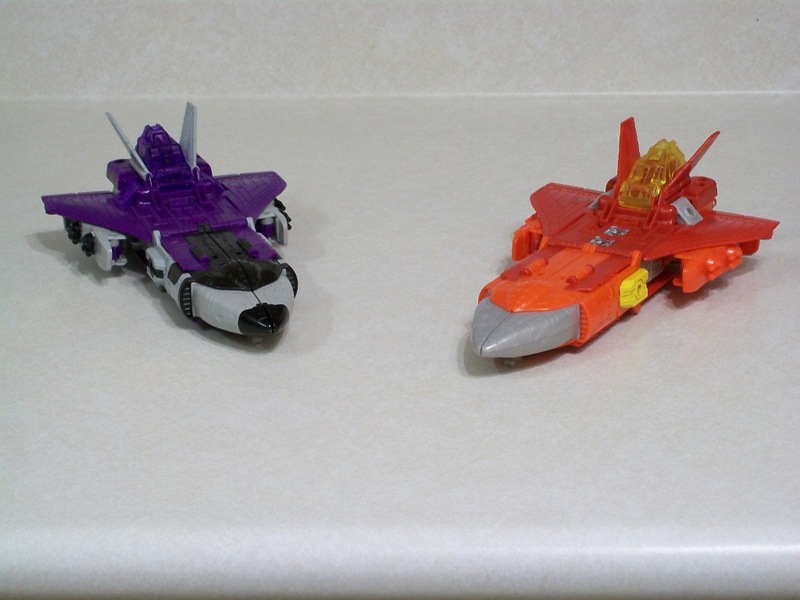 But Astrotrain is extra special in that regard because he's got two: a steam engine and a space shuttle. And this...this is not a space shuttle. I'm not entirely sure what to call it. A starship, maybe? There's a lot of sculpted detail on it that makes it seem like it's pretty freaking gigantic, though the huge cockpit at the rear for Darkmoon to ride in kind of puts the lie to that. The cockpit is in a bizarre place as well, at the rear of the ship instead of the front where a pilot would logically sit. But even though it's not "right", the shuttle mode is well-designed. It has a distinctive silhouette, sleek, wide and a bit flat. The four black gun turrets on the sides really jump out in a good way, and the paint scheme really serves to draw your attention to the sharp nose section. Unfortunately, the paint work is a bit uneven. The front half of the shuttle has a nice mix of black, purple and grey, with a good amount of paint and plastic colours mixed together. The rear half is almost completely unpainted, cannons aside, and so is almost entirely bare purple. A couple stripes on his wings or tailfins would have gone a long way to add some interest to the figure. Astrotrain has eight different 5mm ports accessible in this mode, so if you're of a mind to you can have him bristling with weapons and TM gun pods. He doesn't have any foot pegs for standalone TMs, which limits the cross-play possibilities. 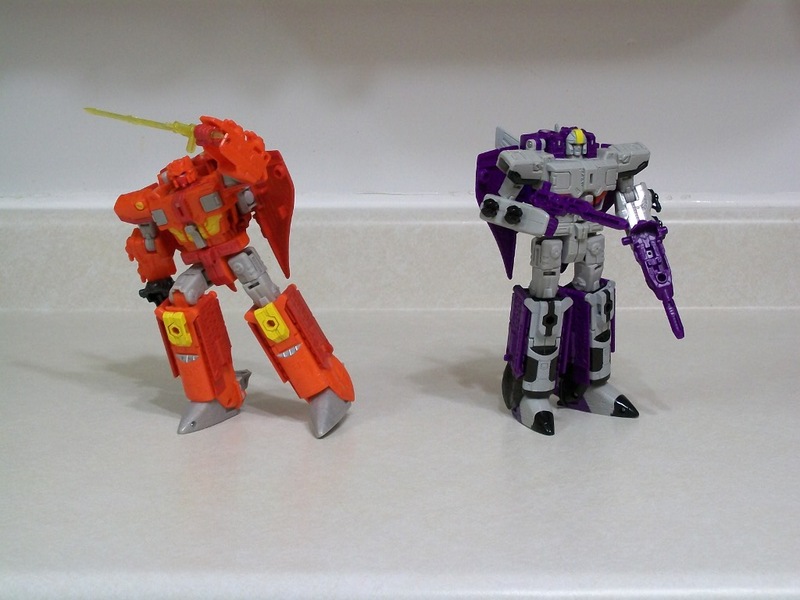 The Voyager-class figures in this line seem to all be lacking in that regard compared to the frankly amazing Deluxe assortment, and Astrotrain is no exception. 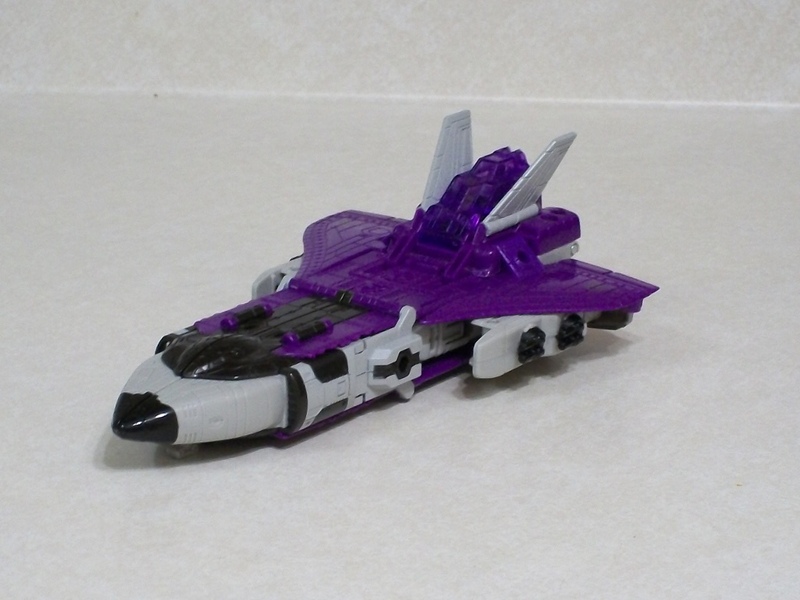 Astrotrain's shuttle mode shows a lot of potential, but whether you're thinking about looks or play it's lacking. Train Mode: Astrotrain, alas, isn't a steam engine either. In fact, I'm not entirely sure it even qualifies as a "train". In my Sentinel Prime review I joked about this being his "wall" mode, and honestly that's not too far from the truth. The shuttle mode featured a lot of detail that suggested it was meant to be really, really big, and in train mode it's even more clear. This thing is five or six stories tall, as long as a city block and would be completely incapable of rolling down anything but a perfectly straight track because it's a single gigantic car with no joints or articulated segments. Looks-wise, the train mode is fairly impressive. There's not as much painted detail as in the other modes, but the plastic colours are mixed together so well that it's definitely not boring. And the ton of sculpted train details really jump out, though not so much as they would if they'd been painted. Unfortunately, the cockpit and shuttle wings just hanging out on the middle of the train go a long way towards undoing all the hard work everywhere else. Train mode doesn't have as many 5mm ports as shuttle mode, only featuring four. But four is still plenty if your goal is to turn Astrotrain into a heavily-armed war machine. I'm not sure what to make of this mode, obviously. A lot of work clearly went into it, and I want to like it, but it's still all sorts of nonsense. Titan Master: I'm running out of ways to say "this guy is a totally average little head dude". Suffice to say, Darkmoon is built exactly the same as every other TM in the lineup and suffers from the same lack of paint in robot mode. His head mode is a good likeness of Astrotrain, though it's marred a bit by his hands sticking up from behind the face like a set of antennae.